My name is Jacqui and I live in Tunbridge Wells with my husband and our three young children. I was a keen hobby baker for many years, trying out recipes and designs on any willing family and friends, but in April 2017, with all the children getting ready to head off to school, I took the plunge and started Sprinkles Cakery from our newly renovated home kitchen. Since that day almost 2 years ago I haven't looked back. The continued support from family, friends and customers has been amazing and is the driving force behind helping my small business to grow. Each cake is baked to order using free range eggs and quality ingredients to guarantee you the freshest cake possible. All toppers and decorations are also handmade to order, making each piece unique, and every working day different. I am a self taught baker but I have also achieved a Level 1 City and Guilds qualification in Confectionery, and more recently a Level 1 C&G in Sugar Modelling. I am also a member of the British Sugarcraft Guild. The business is covered with public liability insurance and I also hold a current Level 2 - Food Safety and Hygiene (Catering) certificate. The kitchen was awarded a level 5 (Very Good) Food Hygiene Rating from Tunbridge Wells Borough Council on its last visit. It turns out that I married into a family with a history of baking as the late Grandad Henderson used to have his own bakery shop in the north of England. I had the pleasure of baking many a rum soaked Christmas Cake for him! LUCY - TUNBRIDGE WELLS "Jacqui made both of my children's birthday cakes and they were amazing. A very talented lady that I would highly recommend." CLAIRE - LONDON "Amazingly creative and yummy cakes for all occasions. Jacqui's talents never cease to amaze me. Her fruit cake in particular is possibly the best I've ever tasted." LAURA - TUNBRIDGE WELLS "Beautiful cakes that taste as good as they look! Highly recommend!" CAMILLA - TUNBRIDGE WELLS "Amazing creations! So impressed by the designs and the attention to detail." JENNI - TUNBRIDGE WELLS "Jacqui has made all my special occasion cakes since I moved across the road from her a couple of years ago! 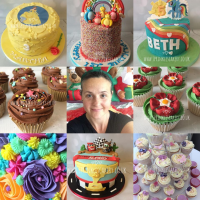 She is a true perfectionist and will go above and beyond to create the most amazing cakes!" HELEN - SOUTHBOROUGH "Fantastic cakes, delicious and carefully crafted, wish I was so talented."